*The performance of "Untitled (Lesson)" by Nance Klehm will be presented at approximately 8:00pm during the opening reception. This one goes out to all you bloated-stomach Thanksgiving celebrants, you 4am Best Buy Black Friday tent-pitchers, youDamien Hirst diamond skull collectors, you non-recyclers and you Gucci Mane enthusiasts. These are foodstamp and slim wallettimes after all, and by now it should be clear that the best way forward is on your tiptoes, preferably in some nice soft leather moccasins. Your friends at BEN RUSSELL are here to help you focus your art consumption by 2/3rds, to find a use for all yourapple picking surplus and, if you do end up throwing anything away, to make sure that it ends up in that compost pile out back. With our help, you'll realize that gaudy neon flourishes are so 2008, that neo-minimalism persists only because Minimalism was abandoned far too soon, and that even "less is more" can be LESSENed to much less. 1) ABATE: From a Paiute American Indian reservation in California, ecologist/urban forager/gardener Nance Klehm gives us a virtual lesson on how to reduce and reuse our trace in the material world. 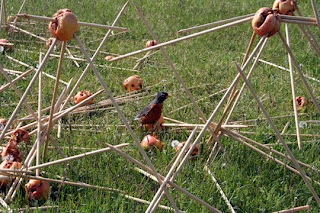 2) DECAY: Casey Lurie presents Apple Structure 2, the second iteration in a series of outdoor structures designed to be built using only quarter-inch dowel rods and apples as joints. 3) DIMINISH: In which the cash money ice glitz bling of hip-hop and R&B's greatest is subjected to the minimalist compositional tendencies of Joe Grimm's sonic minimalism/process art installation. 4) MINIMIZE: Complicating the transcendent ambition of high modernism's abstract expressionism, Ben Foch employs a common house painting roller to create a large scale gestural painting with an economy of means. 5) REDUCE: Michael Snow's 1967 seminal structuralist 16mm film Wavelength, comprising of a 44:00 zoom across a NYC loft, is screened in its 2003 15:00 video iteration as WVLNT (Wavelength For Those Who Don't Have the Time). BEN FOCH was born in Park Forest, IL. in 1977. He received his BFA from The School of the Art Institute of Chicago in 1999. Foch's practice is diverse, utilizing several formal devices to reach his ideological ends, specifically the boundaries and definitions of artistic expression and the minimum criteria for an objects claim to high art. He has exhibited nationally and recently at the now defunct Pilsen space VEGA ESTATES and the Hyde Park Art Center. Foch states: "The next logical space for pictorial investigation is economic. Formal distinctions are fundamentally economic distinctions and perception is the currency of the future." He lives and works in Chicago. JOE GRIMM is a Chicago-based artist who uses sound and light to investigate sensory experience and its construction. His work applies rational, structuralist tools in pursuit of irrational, ecstatic results. Performances and installations frequently take the form of meditations: resonance, repetition, friction, and disintegration become the hypnotic focal points in an attempt to reach a state of inner tranquility and heightened attention to sonic minutiae. He has shown at CAPC Bordeaux, La Casa Encendida Madrid, BMOCA, The Boston Cyberarts Festival, and in basements and squats worldwide. NANCE KLEHM is a radical ecologist, designer, urban forager, grower and teacher. Her solo and collaborative work focuses on creating participatory social ecologies in response to a direct experience of a place. She grows and forages much of her own food in a densely urban area. She actively composts food, landscape and human waste. She only uses a flush toilet when no other option is available. She designed and currently manages a large scale, closed-loop vermicompost project at a downtown Chicago homeless shelter where cafeteria food waste becomes 4 tons of worm castings a year which in turn is used as the soil that grows food to return to the cafeteria. Nance has shown and taught in Mexico, Australia, England, Scandinavia, Canada, the Caribbean, and the United States. Her regular column ‘WEEDEATER’ appears in ARTHURmagazine. CASEY LURIE is an artist and designer based in Chicago. Born in Goleta, California in 1976, Casey is a recent graduate of Northwestern's Art Theory and Practice department (M.F.A., 2009) and has also studied at the Glasgow School of Art in Scotland, and California Institute of the Arts (B.F.A., 1998). A trained cabinet maker and carpenter Casey's work takes many forms and often explores the tension between man-made constructions and natural processes. Casey's work has been exhibited in the US and Asia. MICHAEL SNOW is considered one of Canada's most important living artists, and one of the world's leading experimental filmmakers. His wide-ranging and multidisciplinary oeuvre explores the possibilities inherent in different mediums and genres, and encompasses film and video, painting, sculpture, photography, writing, and music. Snow's practice comprises a thorough investigation into the nature of perception. He played a major role in the "structural" film movement with such works as Wavelength (1967), Back and Forth (1969), and La Région Centrale (1971), exploring the world through deliberate and explicit decisions about formal approaches. Snow has had solo exhibitions and/or film retrospectives at the Venice Biennale, New York's Museum of Modern Art, the Paris Centre Pompidou, Cinémathèque Française, and elsewhere.